Wash and clean the chicken, remove the fat and skin. Add salt and pepper to taste. Heat the olive oil in a pan and lightly fry the chicken on both sides. Combine the sugar, water and vinegar and pour onto the chicken. Add the mashed garlic, the thyme and oregano. Let come to a boil and when it does, lower the heat. Add the bay leaves, cover the pot and let cook for approximately 30 minutes. In the meantime, wash, peel and julienne the carrots. Cut the onion into thin slices and set aside. After 30 minutes, turn the pieces of chicken and add the carrots and onion, taste for salt and add more if necessary. Cover and let cook until the chicken is cooked completely and the carrots and onions are tender. Serve with rice and salad. Enjoy! If you have a pressure cooker, you can use that for this recipe. Follow the instructions to cook the chicken and remember to add the veggies at the end. You can use any herbs you like. I'm always on the lookout for simple and delicious recipes that can help me save on time without sacrificing taste. 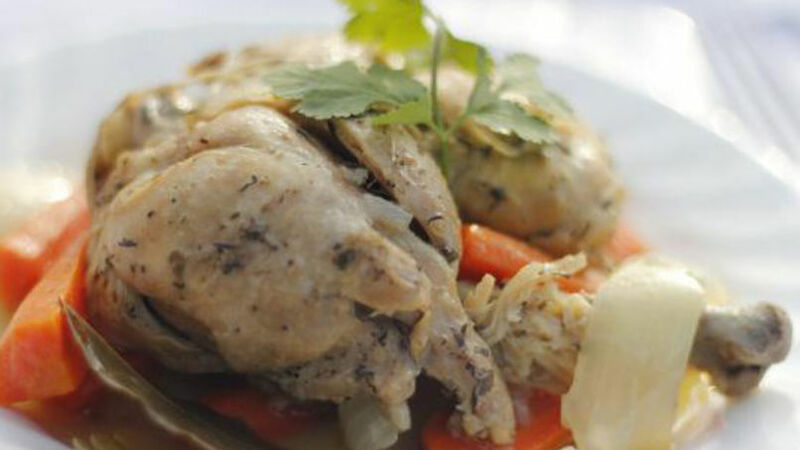 One of the recipes I like is pollo en cuñete (chicken cooked in vinegar). My mom prepared it very often and I thought it was because she really enjoyed it, but now that I'm older and have kids I understand that it probably had more to do with how quickly she could have a delicious and nutritious dinner on the table. In Mexico, the term “en cuñete” refers to food that is cooked in some type of vinegar. White vinegar is one of the most popular, but apple cider vinegar is easy to find and offers a fruity taste. I used classic white vinegar for this recipe, but you can substitute it if you like.